Coinstar Exchange wants you to know that they are here to help with your holiday blues. Over the holidays, did you get any gift cards that you weren’t too excited about? Looking to find a way to get rid of them and exchange them for cash? Tired of holding onto all that plastic that you KNOW you will never use? Well, guess what?! I have great news! 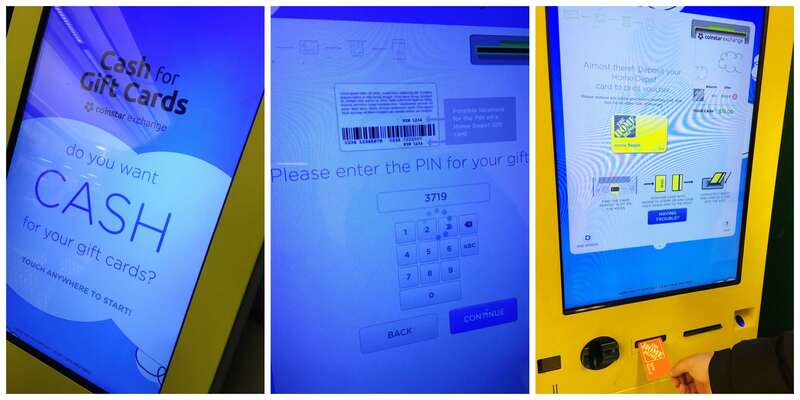 I just found out that Coinstar Exchange has machines all around the country that allow you to trade in your gift cards in exchange for money. I thought I’d test it out and let you know what I thought. The results? Easy as pie! I hate to say it, but we always don’t get the gifts that we want and now I found the perfect solution. When I need to exchange gift cards because my famliy just doesn’t even KNOW ME, I now know where to go. This way, there’s no feelings hurt, either. I can quietly make the change myself. First, I went to the website and searched my zip code to find the nearest Coinstar kiosk. Then I searched for the bright yellow kiosk within the Super Stop & Shop that popped up in my search. I didn’t have to drive far. In fact, it was just a few blocks away. Odds are you will be able to find a close location as well. There are so many participating locations throughout the country. Coinstar Exchange conducted a consumer survey that found 37% of people who received gift cards as gifts last year still haven’t used them all! I’m am absolutely one of those people! This was so perfect for me. Is that bad to say? I’m not ashamed to admit it. LOL! When you don’t use your gift cards, what ends up happening is your balance starts to decrease. Fees incur and you will notice that you start to lose money. That’s no fun. This is a great solution for people who just want to get rid of these gift cards and move on with their lives. Does Coinstar buy gift cards? Yes! I think this is the beauty of these machines. The process is incredibly simple, too. When I arrived to the closest kiosk, all I had to do was scan the back of my Home Depot card and type in my pin. At that point, I was offered a rate. I didn’t have to accept the rate. I could choose to take it or leave it. If I chose to accept the offer, which I did, the kiosk asked me to input my driver’s license and email for identity verification. Do not forget your license! All in all – I think I was there for less than 3 minutes. 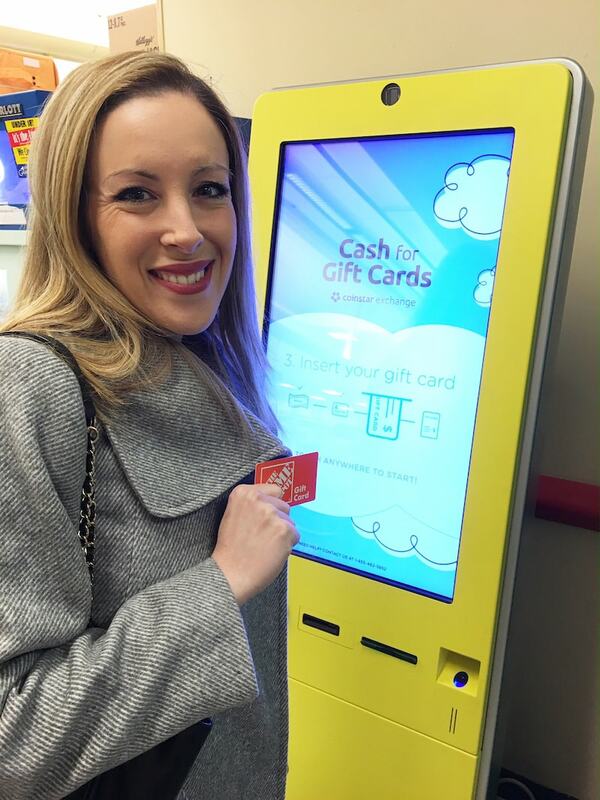 As soon as I put all my information into the machine, I then received my voucher. What Is The Coinstar Gift Card Exchange Rate? The Coinstar gift card Exchange rate is up to 85% of the value of the gift card. Each card varies. You need to have at least $20 on the card to be able to use the system. Those are two hard fast rules. So, in essence, every card will be different. It all depends on what kind of card you are bringing along to trade in. Different cards provide different exchange rates. But every card needs to have at least $20 on them to trade. Happy place! 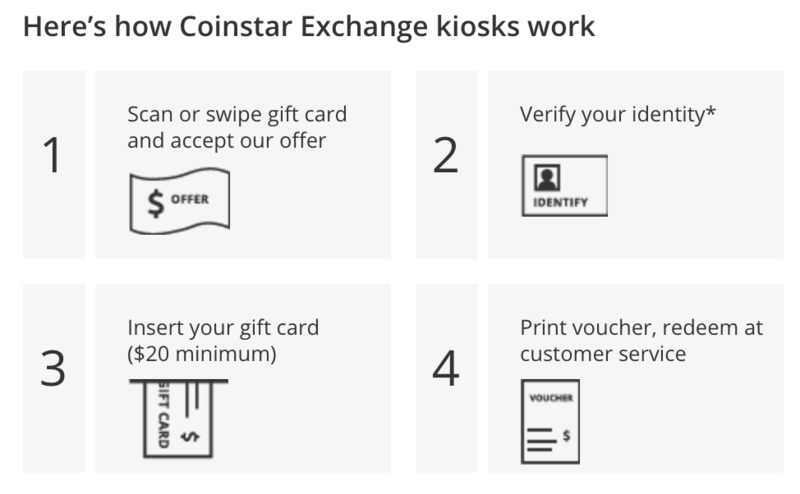 Are you ready to try the Coinstar Exchange system out for yourself? Your state-issued driver’s license or ID. Your Visa, MasterCard, American Express, or Discover credit card or debit card. You may also need your cell phone, so please have it handy. 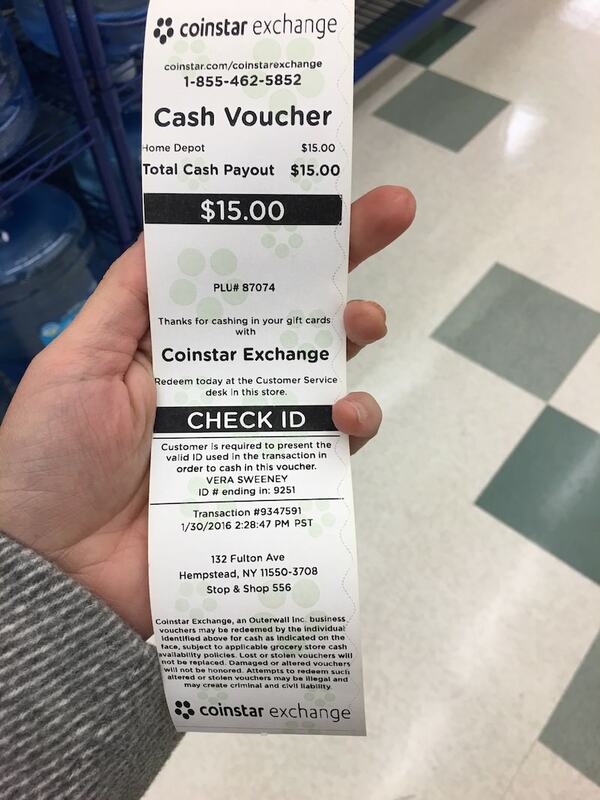 If you are looking to exchange some unwanted gift cards, be sure to visit a local Coinstar kiosk in your neck of the woods! Have you used this system before? What did you think?